The level payment plan is a way for Nebraska City Utilities’ (NCU) customers to pay the same amount each month regardless of the current billing for the individual customer. This plan allows the customer to budget the same amount each month for utilities for a twelve (12) month period. NCU will use the previous twelve (12) month’s billing information and use that total divided by twelve (12) to determine the monthly level payment amount for the next year. See below for guidelines to participate in this program. If you are interested in the level payment plan please contact our business office at (402) 873-3353 or use our online form to have an application sent to you. Customer needs to be current. Take yearly estimate divide by 12. Roll credit or balance owing into calculation. No refunds or requirement to pay off balance if deficit occurs from low estimate. No late charges, No interest paid. Customer needs a 12-month history in existing residence. Customer may be late once in a 12 month level pay year. Payment must be paid by the final notice date or the customer will be dropped from plan. Available to residential customers only. New program year begins in May. Option to adjust monthly payment amount if price changes dramatically. Customers of Nebraska City Utilities have the option to have their bills paid automatically from their bank account. Customers that choose this method of payment will receive their regular bill each month for review and to record the payment for future account reconcilement. The payment will be drawn from their account on the due date. If the due date falls on a weekend or holiday, the payment will be withdrawn on the first business following the due date. If interested in taking advantage of this payment method please contact our business office at (402) 873-3353 or use our online form to have an application sent to you. Deposits are required for new customers of Nebraska City Utilities (NCU) and are due at the time service is applied for. Deposits are required for all commercial accounts. Deposits are required for residential accounts unless the applicant owns the home where they are applying for service or if an acceptable letter of credit from a prior utility company is provided to NCU. See below for more information concerning deposits. Deposits for service are as follows: Electric $100.00, Gas $100.00, Water and Sewer $50.00. For any combination of services please add individual amounts together. For example if electric and gas service is needed the deposit would be $100.00 + $100.00 = $200.00. If it is an all electric residence the deposit is $150.00. Deposit are held for a period of three (3) years. A letter of credit from a previous utility provider may be used provided service was obtained from them for a minimum of three (3) years and the letter of credit is acceptable. Deposits for commercial accounts are based on prior history of an existing business. Option 1) The deposit is two (2) times the highest bill in the preceding twelve months for all accounts with a billing history and twice as estimated bill for new accounts. Option 2) The deposit is equivilant to the highest bill in the previous 24 months for all accounts with a billing history or highest estimated bill for new accounts provided the account is set up with Automatic Bank Payment (ACH). Should a payment ever be returned from the bank the deposit will be required to be two times the highest as stated. Financial Instrument (C.D.) 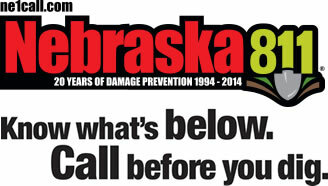 in the name of Nebraska City Utilities from which the depositor shall receive the interest. Letter of Credit (Guarantee) from an approved financial institution. Deposits are held for a period of three (3) years after which it shall be refunded if the depositor has maintained a good payment record. Customers that have deposits of $500.00 or greater with Nebraska City Utilities will be paid interest on the deposit from the day the deposit is paid until the deposit is refunded to the customer, applied towards payment of the customer’s bill or until the account is closed. The interest rate is 1.92% per annum, simple interest. (5 year treasury rate as of 10/01/17) paid/applied on the next regular billing date after the deposit is eligible to be refunded or the account is closed. Up to 13 months of the previous history of electric and gas service. All electric rates are subject to a Production Cost Adjustment (PCA). The rates include a Production Cost Base of $.0376/kWh. Whenever the monthly Production Cost exceeds or is less than, the Base Cost, a Production Cost Adjustment may be included in the billing charges. Production costs shall include all costs of purchased power and energy and all fuels and lube oil consumed by the local generation or other related costs directly attributed to local generation. There may also be an adjustment for losses upon the previous year’s sales and production data. 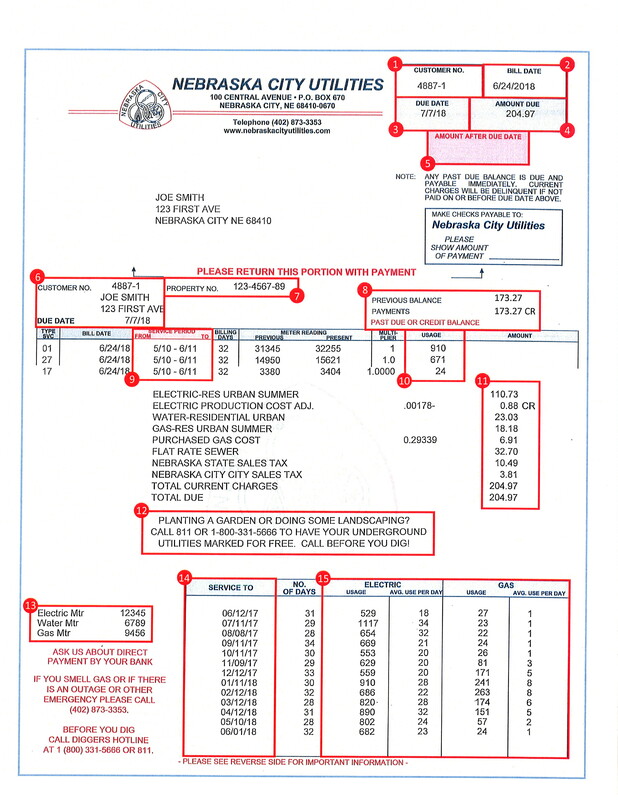 Purchased and produced gas costs shall be calculated for each month, summer and winter seasons, or as otherwise deemed appropriate by Nebraska City Utilities. For these purposes, the “Cost of Gas” shall mean the total variable cost, including all variable transportation, commodity, fuel and other supply and storage related charges.